Occupy Newfoundland and Labrador: Are taxes about to get even more regressive? A recently published memo written by economist Wade Locke (who was hired by the provincial government to advise them on their "sustainability plan") has recommended a 2% increase in the HST to help raise revenues. This would boost revenue by about $200 million, and would be a significant contribution to digging us out of the fiscal hole we are in due to the excesses of the Williams government (read more about our current budget challenges here). However, sales taxes are regressive so this tax proposal will fall harder on low and middle income people than on high income people. Combining this with the huge income tax cuts of the last few years, this would be a major shift of the tax burden from the rich onto the poor. 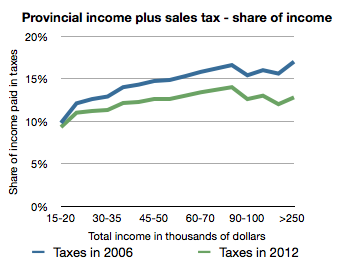 Below are some charts showing the share of income paid in provincial income and sales taxes, for different income levels (inflation adjusted to 2009 dollars). First, we have a chart comparing taxes in 2006 to taxes in 2012. There was a considerable drop due to income tax cuts, with high-income individuals receiving the largest benefits. In the next, we compare 2006 to what taxes would be if HST was increased by 2%. According to this estimate, the three quarters of tax-filers who earn less than $40,000 per year would actually be paying more tax than they were before the huge surge in oil revenues, and those people earning between $40,000 and $70,000 would have decreased their tax burden by less than 1% of income. 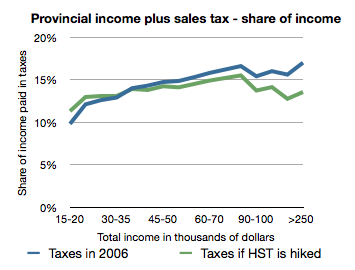 In contrast, the wealthiest 1% would be paying 4-to-5% less than in 2006 despite the HST hike. The people of Newfoundland and Labrador should insist that any increase in HST be made in conjunction with income tax reforms that increase rates for high income earners and lowers rates for those with income below $40,000. Otherwise, this government is just taking from the poor and giving to the rich. Earlier posts on taxes in NL with more details on sources of data can be found here and here.